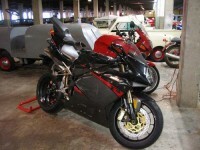 Not unusual for Italian motorcycle manufacturers, MV Agusta has had its share of financial troubles. In the 1990’s, it was struggling. But in 1998, they announced that with restructuring, they were able to continue long-term production. To demonstrate what they were capable of, they introduced the F4. 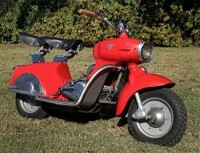 Polish-made scooter, Osa was produced in the Eastern European bloc. 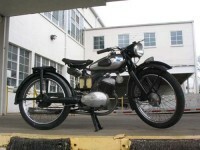 Design work started as early as 1955 with the first production examples leaving the factory in 1959. 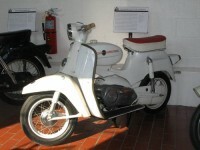 Production of M50s continued until 1962 when an improved version called Osa M52 appeared. 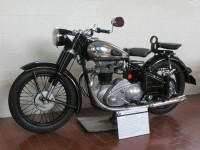 In the 1950s and ‘60s there were over 300 motorcycle manufacturers in Italy. Paglianti was one of the small manufacturers in business from 1948-1966. 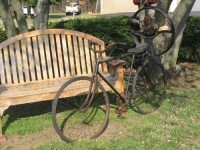 Peugeot is considered to be the most prestigious French bicycle. 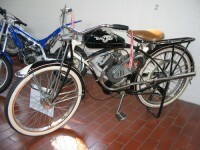 In the early 1920s, a Parisian company named SICAM (“Société Industrielle de Construction Automobile et Motocycliste”) began constructing engines for bicycles. The Peugeot Scoot’elec is considered to be the first successful mass-market electric scooter. 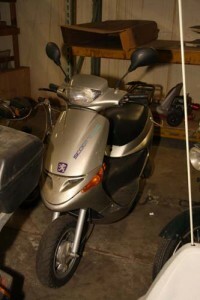 It was based on and shared many parts with Peugeot’s entry-level gas scooter, the Zenith. The Scoot’elec shared both body panels and suspension components with the Zenith, but differed greatly in the frame. The on-board charger, controller, and cord are stored beneath the seat, leaving only an irregularly-shaped cubby up front for storage. 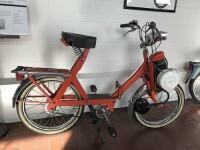 The Pli-Solex is the folding version of the 5000. The frame folds in the center, and the handlebars, seat, and engine may be removed to allow for easier transport or storage. Fonderie Officine Rumi, the Rumi Foundries, were established by Gabrielle Rumi in Bergamo, Italy in 1906. Designed in Germany and built in China, the Sachs MadAss (“Crazy Donkey”)125 is a motorcycle in minimalist form. Weighing only 220 pounds, the motorcycle is packed with unique design features. 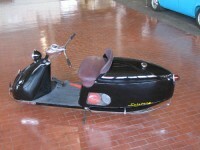 Motorscooters were born out of the necessity of economic depressions. Whizzer motor kits were introduced by Breene-Taylor Engineering Corporation, a Los Angeles maker of aircraft parts, in 1939. In the early 1900s, small towns and farms in America were far from the centers of commerce and the idea of mail-order shopping was essential. 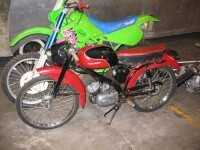 Those sold as Puch’s had two carburetors, while the sears bikes had to make do with one carburetor. The Sabre is the late-model Puch street replacement for the “Compact.” The 5-hp engine and saddle seat was powerful and roomy for two. 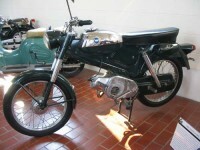 Puch stopped manufacturing motorcycles in 1986.